Preheat oven to 350. Place the bread, sugar, ginger and allspice in a food processor. Pulse until it forms coarse crumbs. Sprinkle 1/2 cup of crumbs along the bottom of an 8 inch baking dish. Pour mango cubes on top and spread out evenly. 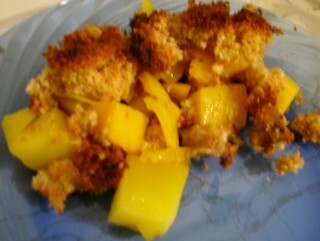 Pour remaining crumbs on top of the mango evenly. Randomly dot with butter chunks. Bake 40 minutes or until the top is browned and the fruit is bubbly. The "brown betty" is an old fashioned type of dessert, dating back to the colonial era. They are not as sweet a dessert as we are used to today but they are low in fat and high in fruit flavor. Traditionally they are made with apples but I think the mango is a good substitute. It is just sweet enough without being overpowering. I used potato bread instead of the usual white bread for a little more robust flavor and a bit of sweetness, but I bet white would do just as well. 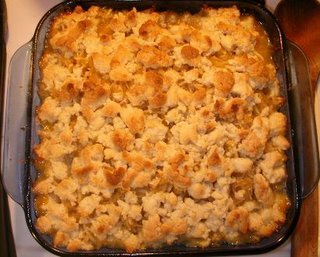 Just make sure not to over bake, the bread crumb topping is pretty dry and it can burn quickly. In a food processor or blender, pulse broccoli, chicken broth, Parmesan, olive oil, garlic and salt until smooth, stopping occasionally to scrape down side. Stir into steamy hot pasta and serve immediately. I thought about adding roasted pinenuts but decided against it. 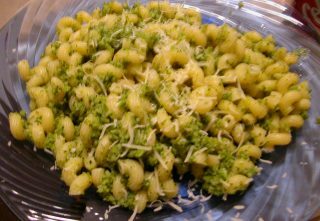 When I have made traditional basil pesto I included them and I probably would have here but they were over $4 for a tiny package at the grocery store and I wondered if they might add a heavier nutty flavor that would be at odds with the broccoli. 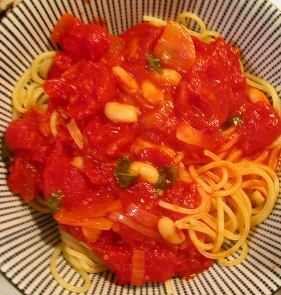 At any rate, I am pleased with how this turned out, some times we go through a heavy meal period and this is a nice change: quick, fresh and healthy. Place the dried chiles in a food processor or blender. In a medium pot, bring chicken stock to a boil. Add the cider vinegar and stir. Pour into food processor. Allow to soak for about 10 minutes, then add orange juice concentrate, tomato paste and brown sugar. Pulse into a smooth paste, then add 1 tablespoon of the chile seeds and blend until smooth. Add more broth if paste is too think to pour. In a large sauce pan, heat the oil. Then add the onions and garlic and sauté until onions begin to brown. Pour into slow cooker. Rub salt and pepper all over roast and then coat with flour. Using the same saucepan as the onions, add pork loin and brown evenly, rotating the meat occasionally. Once browned, add to slow cooker. Then, pour 1/2 cup water into skillet, bring to a boil and scrape up browned bits. Pour into the slow cooker along with the chile sauce, stirring well. Cover and cook on low for 5 to 6 hours. Pull apart with fork before serving. 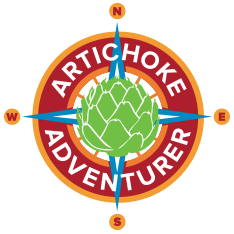 We used this to make truly awesome burritos with cilantro-lime rice, black beans, salsa, sharp cheddar and sour cream. We actually made it on a Saturday, each had a burrito then invited friends over Monday (4 more burritos eaten) and we still had plenty to freeze for a later date. Preheat oven to 350. In a medium bowl, whisk together flour, baking powder, baking soda and salt. In a large bowl, cream butter with sugar until fluffy, about 3 minutes. Add eggs, one at a time. Beat in vanilla, sour cream. Add dry ingredients until just combined. Spoon batter into lined cupcake pans. Generously sprinkle brown sugar on top of each muffin. 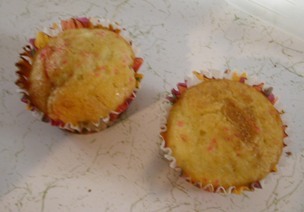 Bake 20 to 25 minutes or until a toothpick inserted in the middle of the center muffin comes out clean. I love sour cream. More than I should, really. I like it in cakes, in muffins, on tacos, on red beans and rice, the list goes on. These muffins are really moist but not too sweet. I don't like a breakfast muffin that is too cupcake-y and this, despite the two kinds of sugar and the sour cream isn't. While I generally stick to this recipe, when my mom makes them around holidays she subsitutes colored sugar for some of the brown sugar that you sprinkle on top. Either way is good but don't skimp on the vanilla. Preheat oven to 350. In a medium bowl, combine all dry ingredients. In another bowl, combine the eggs, vanilla and sour cream until well blended. In another bowl, combine cooled butter and oil. Mix thoroughly. Slowly add cold water, mix until combined. Add dry ingredients all at once and mix until well blended. Add the egg/vanilla/sour cream mixture and beat until throughly combined. Pour into two greased and floured* 8 inch round cake pans. Bake 50 minutes or until a toothpick inserted in the center comes out clean. Cool and ice. Excellent with dark chocolate fudge icing. My sweet husband made this for me for Valentine's Day. 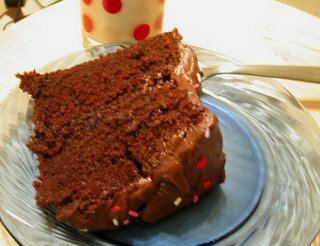 It's an extremely rich and moist cake. You couldn't ask for a better dessert on my favorite holiday. In a large bowl, beat butter until creamy. Add confectioners’ sugar and continue to beat until fluffy, about 2 minutes. Add vanilla, beat 30 seconds. Add cooled chocolate and and beat 1-2 minutes. Icing should look glossy and smooth. Covers a 2 layer cake or about 24 cupcakes. 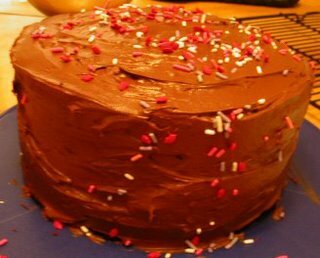 Excellent with the Dark Chocolate Fudge Layer Cake of Love. The best, most chocolate-y icing ever. I wish I could eat a bowl of it every day. Preheat oven to 350. In a large bowl combine the flour and sugar. In smaller bowl, cream together egg yolks, butter, and sour cream. Add to the flour mixture and stir to combine. Add lemon zest and stir again. The flour mixture should come together in a course texture, almost like cornmeal. Add a little (1 1/2 - 2 tablespoons) of water and mix until the dough comes together. It will be thick and dense. Divide in half and set aside. Quickly toss the apples with the tapioca and lemon juice. 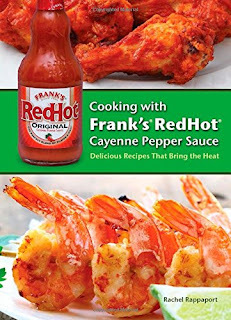 Spray the bottom and sides of a 8 inch square pan with nonstick baking spray**. Firmly press 1/2 of the dough into the bottom of the pan. Pour the apple mixture on top of the dough. Crumble the remaining dough over top. Bake 1 hour or until golden brown and bubbling around the edges. Serve warm. 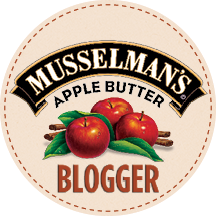 This is a really wholesome feeling dessert, not too sweet and full of apples. It's actually half way between a crumble and a pie, it has a bottom layer of pastry but instead of the traditonal double crust, it has a crumb topping. This makes it much quicker and easier to make, no rolling out, no piecing together broken dough. The dough is almost a dense cookie dough and is really easy to work with. I think it would work with other types of apple but I think a tart apple would be best, it contrasts nicely with the slightly sweet topping. Yum! 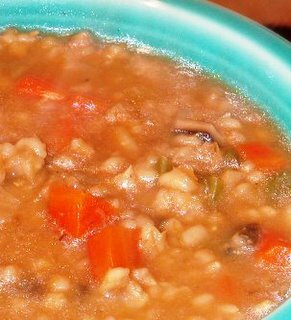 In a large pot, combine barley and stock. Bring to a boil then reduce heat and simmer 1 hour. Meanwhile, in a saucepan, heat oil and saute onions until just starting to brown and soft, 5 minutes. Add the fresh mushrooms and saute an additonal 2-3 minutes. Add garlic and brown. Add mixture to the barley and stock. Season with paprika, salt and pepper to taste. Contiue to simmer for about 1 hour. My husband has fond memories of mushroom barley soup at the 2nd Ave Deli in NYC. This soup is even better! The paprika give it some spice but it still retains that homey flavor you expect from barley soup.